Various users have reached out to me asking how they can share links / pages as they surf the web from their mobile device with their network in IBM Connections. The trick is to use what's called bookmarklets. 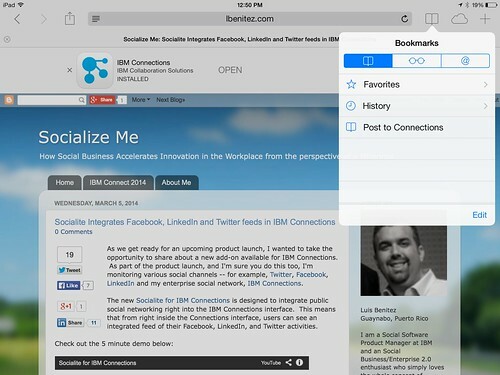 Follow these instructions to add the two bookmark lets to your browser and then you'll be able to quickly share links from your mobile browser to the IBM Connections Mobile app. I've written these instructions for Safari on iPad so these might vary based on your browser and/or mobile device. Go to your bookmarks (the book icon in the top right) and tap "Edit" in the bottom right. Tap the new bookmark you just made of this page. Now to do the actual share, go to any web page, go to your bookmarks and tap the bookmarklet you want to use. If you want to create your own bookmark lets for other things, check out this documentation on opening links to start the IBM Connections Mobile app. And if you are interested in other Bookmarklets (e.g. for Digg, Reddit, Pinterest, etc) check out this page.